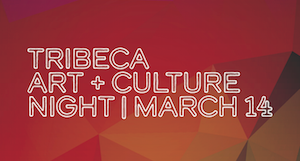 Please join us and over 20 other participating art spaces for Tribeca Art + Culture Night. The Pass gives you access to all venues open from 6-9PM. At each venue, you can meet artists, curators, gallerists, and non-profit founders. You can create your own self-guided tour. Art specialists - Curators, art critics, & artists, will take your on a 1h tour. Tours start at 6:00, 6:30, and 7:00PM.